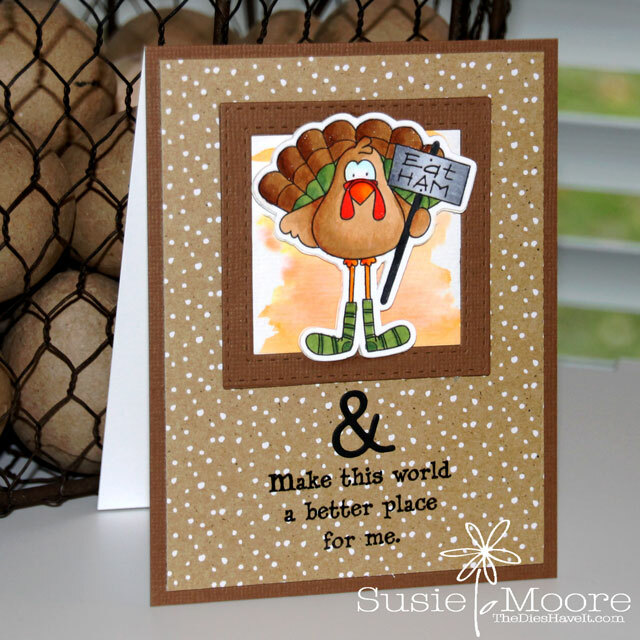 I thought it would be fun to start off November with a turkey card. And this one makes me laugh. Don't you love the sign? Eat ham....ha ha ha. You can find this adorable turkey image by clicking right here. It is from Whimsie Doodles. I found the sentiment stamp and couldn't believe my luck! I added the die cut ampersand in the middle to connect the two sentiments. I used my Silhouette Cameo to die cut my sign carrying turkey and then I colored him with Copic markers and some Wink of Stella. I stacked the image three deep to give him some depth. I hope you November is off to a wonderful start. At least maybe you giggled at my turkey!! Make it a super great day!